I often like to change things up a bit, like by having breakfast for dinner or a dessert for breakfast. When I cake across the concept of carrot cake pancakes on Joy the Baker I knew that I would be having a dessert for breakfast once again. Carrot cake is one of my favorite desserts and I like the idea of having them in pancake form for breakfast. I also really liked the idea of topping the pancakes with a cream cheese spread like the one used on a carrot cake instead of using syrup. I started with my basic pancake recipe and added some carrots and spices. I could not really have pancakes without maple syrup and since I was going to be spreading cream cheese on the pancakes I thought that mixing the maple syrup into the cream cheese spread would be a nice way to do it. The carrot cake pancakes were easy to make and tasted great! I stacked them on top of each other and spread cream cheese on top of each so they almost looked like a carrot cake in the end. The carrot cake pancakes with maple cream cheese spread tasted almost like carrot cake and I really enjoyed them. It is always nice to have dessert for breakfast! Mix the flour, baking powder, cinnamon, ginger and in a large bowl. Mix the milk, egg, sugar and carrot in another bowl. Mix the cream cheese and maple syrup and add some powdered sugar to get it as sweet as you like. Spread the cream cheese onto the pancakes. Gorgeous! That original cake must be divine! Wow ……. that looks like a decadent breakfast! These pancakes look delicious, I’m starving right now and I could use a gigantic stack of these for breakfast! Whoa! That looks pretty rich for breakfast. I don’t think I could face that much food in the morning! Now, who wouldn’t love a dessert like that for breakfast? What a great idea! Dessert for breakfast! carrot “cake” without butter or oil in the recipe? how brilliant! looks good! how decadent! exactly what the holiday season is about. My hubby would marry me again if I made that for him…carrot cake is his absolute favorite! I’m all for making dessert the main course. Looks good! YUM! Pancakes + carrot cake = divine! Seriously, what could be better? I know, top it with cream cheese icing. I think I’d go into a diabetic coma after eating this but it’d be so worth it. What a great idea! There IS nothing better than dessert for breakfast. Did you finish the whole stack? Thanks for stopping by my blog! My brother loves carrot cake – this would be fun to surprise him with for breakfast one day when we’re both at my mom’s for the holiday. Oh that is a good pile of yumminess. I would be so ready for a nap after eating that!!! That’s a humongous pile of yummyness! You are a master of breakfast dishes. A perfect creation to enjoy on lazy weekend morning. these pancakes look so great kevin! i’m so happy you enjoyed them! i love the use of whole wheat flour too! They sound great – especially the maple cream cheese spread! I am so with you on dessert for breakfast! I bookmarked these after seeing them on Joy the Baker too–now I am doubly tempted to try them myself! My goodness, my jaw dropped when I saw the picture. Amazing! It is dessert for breakfast, but also vegetables for breakfast. Ha, ha! Win-win in my book. I just put back on 10 pounds just thinking about having a stack of these, yum! 10 for originality my friend…I’m in love with this! wow! thats a heap of cream cheese up there 🙂 looks yum! Wow, that’s a change up. Might have to give something this unusual a try. I’m pretty sure I just gained 5 pounds reading this. What a scrumptious idea! I saw these on Joy’s site too and as an avid carrot cake fan I knew I HAD to have them. …Maybe it was the build-up or anticipation or maybe my expectations were too high, but the recipe as post was nothing short of horrible, almost inedible. It needed way more salt, way more spices, way more flavor. You were smart to have seen that and made the changes. oh I love to switch things up all the time…yumm!!! I bookmarked these when I saw them the first time, too! They look so delicious! I just love carrot cake. These look so great! Now that’s the way to start the day. Oh my! That looks awesome Kevin! What a great way to start the day. Um, there’s coffee too, right? You do know how to make your avid readers drool! These pancakes look delicious! First of all, let me say I’m honored to have received a compliment from you on my little food blog. Your site is truly astonishing and mouth watering to boot. And secondly, damn! 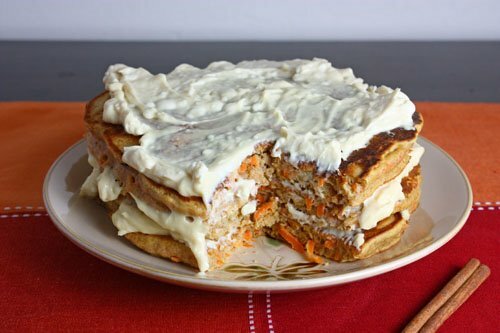 Carrot cake pancakes! Lovely! Unfortunately, these are probably a little too rich for Thanksgiving morning, aren’t they? I’ll have to wait and try them out on the weekend perhaps. Again, lovely site and thank you for checking out mine as well! Yikes! That looks pretty overwhelming for a breakfast — overwhelmingly divine. Damn, I was going to make and blog these today! Still, nice to have a second recomendation to try them, heh. What a great idea Kevin! Dessert for breakfast! Gorgeous Kevin! A wonderful breakfast. Your pancakes looks awesome! Great idea! YUM! Those pancakes look SO good! I love carrot cake and why not pancakes! How divine! There is something just a wee bit decadent about having dessert for breakfast – I love it!! my gosh! I love this idea! I’m just curious, in her version, Joy the Baker mentions that the carrots didn’t really have enough time to cook and soften up a bit. Did you have similar experience with your carrots? Should we prepare for some crunch in our pancakes? k8inorbit: I enjoyed the texture of the carrots and I did not find that they were to crunchy. WOWZERS. Those look REALLY FREAKING AWESOME. I just found this blog and these pancakes definitely made a good first impression, I made them and they were DELICIOUS, my friends especially liked the maple cream cheese, great idea! how many servings was the recipe intended to make? Anonymous: I normally get about 4-6 plate sized pancakes as seen in the photo which should satisfy 2 hungry eaters. Oh man!!! Carrot cake AND pancakes? This is a phenomenal combination that I think I'll just have to try tomorrow. I'm such a sucker for carrot cake and the fluffy texture of pancakes. Thanks for sharing. They look absolutely delectable. What a great idea! I am looking forward to trying these pancakes, they sound so good! I just made these pancakes. We loved them. They make an excellent special occasion breakfast!